When reporting information to any of the hotlines below, please include sufficient detail (describing who, what, where, when, why and how) to allow the agency to fully evaluate your information. All reports to any of the hotlines below can be made anonymously. All information provided shall be kept confidential in accordance with all federal and state laws and LSU policies. LSUHSC-NO Hotline – Report suspected violations of any federal or state laws or regulations or any LSU policies. Louisiana Legislative Auditor Hotline – To report suspected misappropriation (theft), fraud, waste or abuse of public funds by anyone. Department of Health and Hospitals Medicaid Fraud Hotline – To report fraud waste or abuse of Medicaid funds by providers or recipients. Office of the State Inspector General Hotline – To file complaints or provide information concerning the operation of state government. U.S. Department of Defense Hotline - To report fraud waste and abuse related to defense contracts. 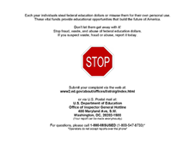 To report suspected fraud, waste, or abuse involving U.S. Department of Education funds or programs. To report Title IX violations or other discrimination in programs or activities that receive federal financial assistance from the Department of Education. U.S. Department of Health and Human Services Hotline – To report fraud or misconduct relating to the receipt or expenditure of HHS grant or contract funds or Medicare or Medicaid services. U.S. Department of Homeland Security Hotline - To report FEMA fraud.